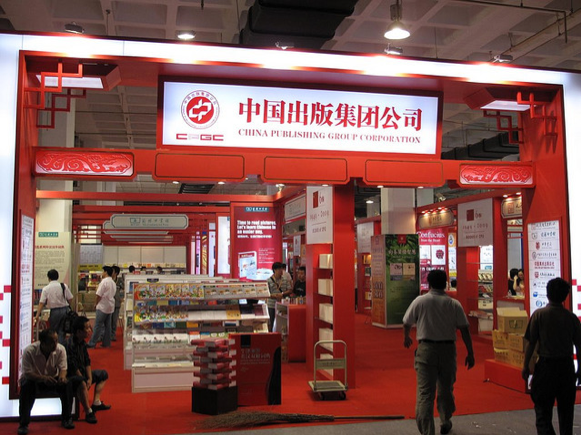 China Publishing Group at the Beijing Book Fair, which opens later this month. With the Shanghai Book Fair opening today, the Shanghai Daily.com reports that with the state owned publishing industry becoming more open to private investment, the mix of what’s available to Chinese readers is expanding at a rapid rate. An estimated 80% of the best-selling books sold in China are from privately-owned companies. And although many are published by state-owned firms, the line between government and private ownership in the publishing industry is beginning to blur – apparently to the benefit of both sides. How rapidly is the market growing? Consider this: In 2011, 370,000 titles were published, a 12.5% increase over the previous year. Forty eight of those titles sold more than 1 million copies each. The total revenue from publishing, printing and distribution reached 1.46 trillion yuan (US$228.62 billion), up almost 18% from 2010. The revenue from digital books is up as well, rising 31% in 2011, and now making up roughly 10% of all publishing revenue. So perhaps not surprisingly, both online bookstores and cell phone providers are moving to take advantage of the trend. In February, for example, online marketplace 360Buy.com announced that it was increasing its offering of digital books to 300,000 by the end of the year, and China Mobile also launched a service that allows its users to read digitally on its cell phones. The changes in book publishing in China are on full display at this year’s Shanghai Book Fair, where 150,000 titles from more than 500 publishers in China.